Burying beetles sniff out small animals that have just died and use the carcass as a ‘nest’ for attracting mates and provisioning their offspring. They carefully prepare the carcass by removing any fur or feathers, rolling it into a ball, covering it in special antibiotic chemicals to keep it from rotting too fast, then burying the carcass with the eggs of their offspring. In our paper out today we show that larger male beetles can roll the carcass into a more perfect spherical shape than smaller beetles, and that this was also associated with lower maintenance costs. A carcass rolled into a perfect sphere creates the lowest possible surface-area to volume ratio, and therefore requires less of the costly antibiotic to keep the bacteria from eating away the carcass before the offspring. This could explain our finding that females on rounder nests lived longer following nesting, implying they had to invest fewer resources in protecting the carcass. Unfortunately burying beetle vision isn’t well studied, with ladybirds being the only other beetle I had available. Nevertheless, their markings are unlikely to be brightly coloured to most insects, as very few have sensitivity into the longer wavelength red region. The colours of the burying beetle seem to be most powerful to bluetit vision. Birds have very well separated long and mediumwave receptors thanks to special oil droplets in their cells that tune their colour sensitivity, possibly explaining why these colours are most powerful to them. 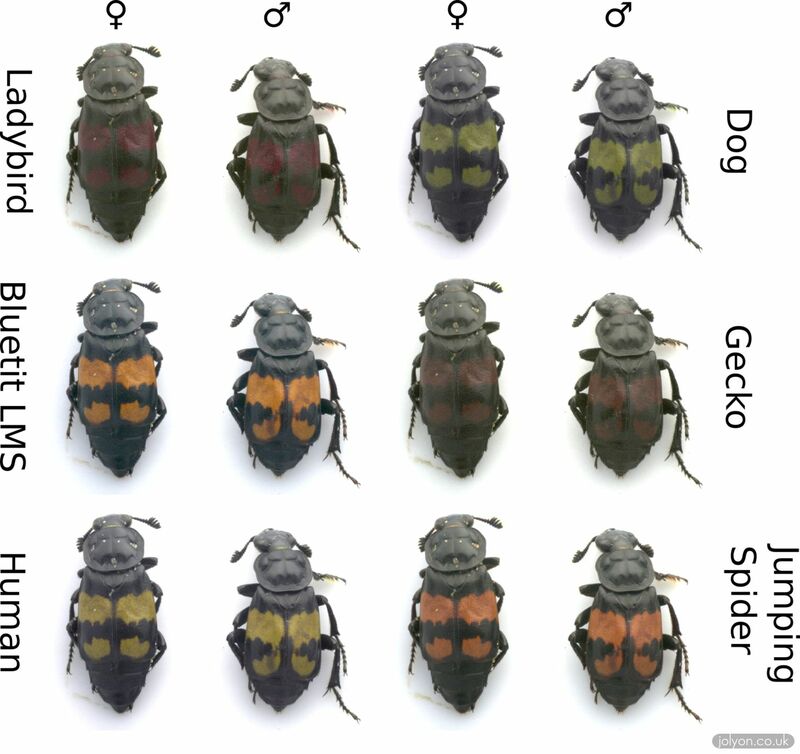 This would imply that the burying beetle’s colours are designed to repel avian predators rather than attract mates (though further work would be needed to investigate that). This photo was taken using a full-spectrum Samsung NX1000 with the 80mm Nikkor EL lens and Baader Venus-U and UV/IR blocking filters. The beetles themselves were kindly donated by Nick Royle.